Lee Bey is a photographer, writer, lecturer and consultant whose work deals in the documentation and interpretation of the built environment—and the often complex political, social and racial forces that shape spaces and places. His architectural photography has appeared in magazines such as Chicago Architect, Architect, Old House Journal, CITE, and in international design publications such as Bauwelt, and Modulør, both published in Germany. 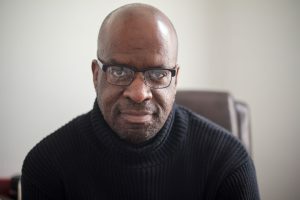 A former Chicago Sun-Times architecture critic, Bey’s writing and reporting on architecture and urban design have been featured in Architect, Chicago magazine, Architectural Record, the Houston Chronicle, Crain’s Chicago Business, WBEZ Chicago Public Radio, Fox News Chicago, Guardian Cities, Monocle Radio, and CBS2 News Chicago. Bey is also a sought-after expert on architecture, architectural history and the development of cities. He has been interviewed by a range of media outlets on the subject, including the New York Times, the Chicago Tribune, CityLab, WTTW Chicago Public Television, WGN-TV, Echappees Belles, an international travel show on TV5MONDE Europe, and That Far Corner: Frank Lloyd Wright in Los Angeles, produced by KCET-TV in Los Angeles. He has lectured before audiences at the University of Hamburg, University of Michigan, City Club of Chicago, the Art Institute of Chicago, the National Trust for Historic Preservation, the Chicago Architecture Foundation, the Arts Club of Chicago, Palm Springs’ Modernism Week, and more. Bey is the author of Southern Exposure: The Overlooked Architecture of Chicago’s South Side (Northwestern University Press, Fall 2019). The book expands on the places and themes of his 2017 photo exhibition, Chicago: a Southern Exposure, documented the rich and largely ignored architecture of the South Side. The show was created for the 2017 Chicago Architecture Biennial. Bey’s photography was the subject of a year-long show in 2011, Chicago Then and Now: A Story by Lee Bey, at Chicago’s City Gallery at the historic Water Tower. His photographs of farm workers’ housing in Alamosa, CO and Chicago’s Archer Courts apartments were featured in the museum exhibit Wohnmodelle: Experiment und Alltag, which debuted in 2008 in Austria’s Kunstlerhaus. Bey, a senior lecturer at the School of the Art Institute of Chicago, also served as deputy chief of staff for urban planning under former Chicago mayor Richard M. Daley. He was also governmental affairs director for the Chicago office of the architecture firm Skidmore Owings & Merrill. Bey was also executive director of the Chicago Central Area Committee. The 2019 NY Statewide Preservation Conference will take place from Thursday, April 25th to Saturday, April 27th at the newly rehabbed and preservation award-winning Sibley Square in Rochester, New York. For tickets. To learn more about Lee Bey, visit his website. This entry was posted in Updates by Amanda Delle Donne. Bookmark the permalink.